There are hundreds of packs on the market and it is easy to get disoriented if you search for one. This is why I have made this short list of the best women’s backpacking packs that are available in 2019. All of them are presented with essential features here (and in more details in my separate full reviews) so you can easily see what each of them offers. The women’s backpacking packs for all the gear on a tour. The packs from completely new series. Modified packs from already existing series. Packs that have been on the market for some time already. Those have stood the test of the time and became “evergreen” items for backpackers. 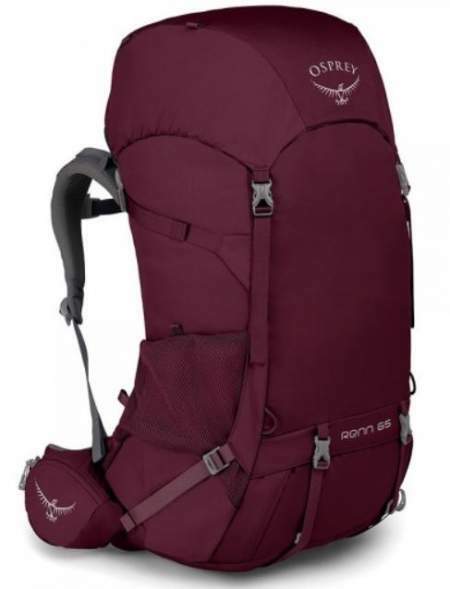 Regarding the capacity, I assume that you would not go on a backpacking tour with a small pack so I have included only those with the capacity above 50 liters. Now, 50 liters may not look enough, but such packs have plenty of attachment options and this compensates for the volume. Also, if you are an ounce counter, you probably go for very lightweight items and those are usually very compact, so a smaller and lighter pack may be good enough. But no worry, you have some very large options here as well. Regarding the weight, there are big differences here. Some are truly ultra-lightweight but in some cases, this is on the account of features. Some models are heavier but they offer everything you need on the trail. So, in general, you have the following types: ultra-lightweight, very lightweight, lightweight, and heavy packs. The examples below will show you the meaning of these terms. Without exception, those are all top-notch items from renown brands, only those that I would use myself on extended tours. My main criterion here is the quality of the packs, I have no connections with these brands, I am not paid by anybody, and have no bias in choosing the models presented here. Many backpacks on the market are essentially unisex, so if you are not particularly small by your body constitution, any of them might be fine for you. But top manufacturers build women-specific backpacks parallel to the corresponding versions for men. This is particularly important in the case of backpacking packs because of their size and the relatively huge weight which you are expected to carry. It is good to have a pack that really follows your body shape, so indeed you might need a women-specific design. Such packs include a number of features that better fit a female figure, like a narrower harness, a shorter torso length, a smaller hip belt circumference, a different shape of the hip belt fins and padding, a different shape of the shoulder harness and its padding, softer buckles, and different colors. I do not believe in an absolute ranking for any outdoor tool. The reason is that there are many possible parameters to consider and they may have different importance to different users and for a different use. Take as an example the rain cover. I would not consider going on the trail without it. But this is for the European Alps where sometimes it is raining every day and this may happen multiple times during a day. You can also have a snowstorm in mid-summer, I just returned from the Slovenian Alps and have experienced this again. But when I was doing my numerous Tenerife hikes (see in the menu above), I really did not care for the rain. So this may be different for you. If you go to a dry area you would rather save some ounces and such a rain cover is not needed. Some recommend using plastic bags instead, but I find this a very bad choice as I discussed in my separate text. How about the weight? You might speak about the weight in an absolute sense, but perhaps rather consider the volume/weight ratio. I guess it should be self-evident what this is, the more volume per kilogram the better. This is why I give this parameter here for each of the packs. But this parameter alone is not enough, otherwise, you might take a plastic bag and have the best possible value for the parameter. 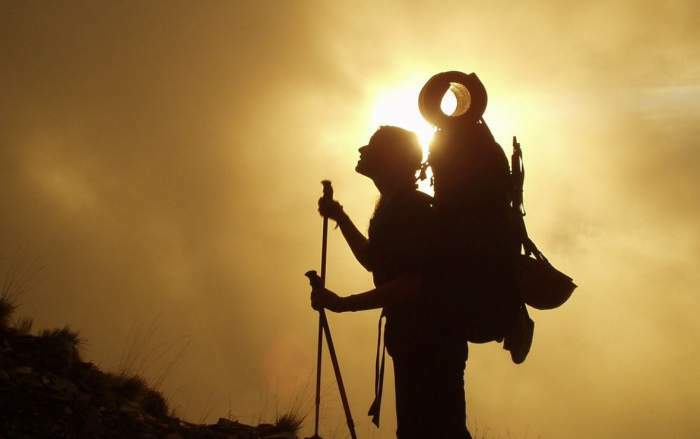 It is important to see if the pack is really able to carry the load which you plan to have on the trail. This then leads to the quality of the suspension, padding, adjustability, etc. With ultra-lightweight packs, you can only expect some minimalist design, so many useful features will be missing, so this is a kind of a trade-off, but you might need them. How about multiple entry points? This is very useful, no doubt. But think a bit about the weight. Such a feature implies extra zippers which add some weight. So, do you really need it? Wouldn’t you rather have something else instead? Below I give the packs with some basic description, all are described in detail in my full reviews, so just follow the links to read more. 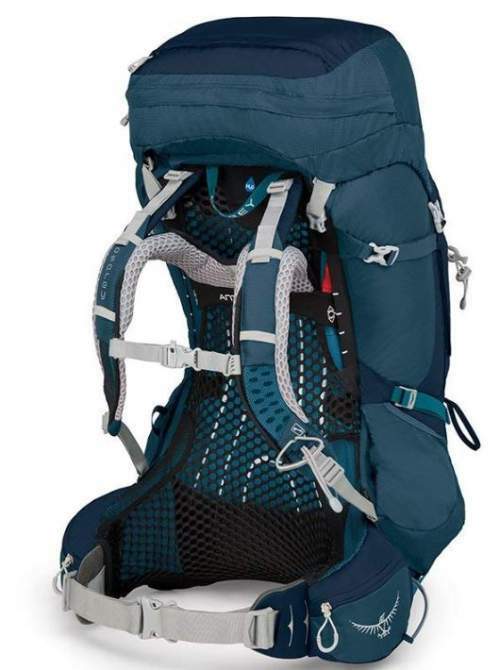 This is a backpack from a brand new 2018 series by Deuter, though it is very similar to the existing ACT Lite 60 + 10 SL pack. 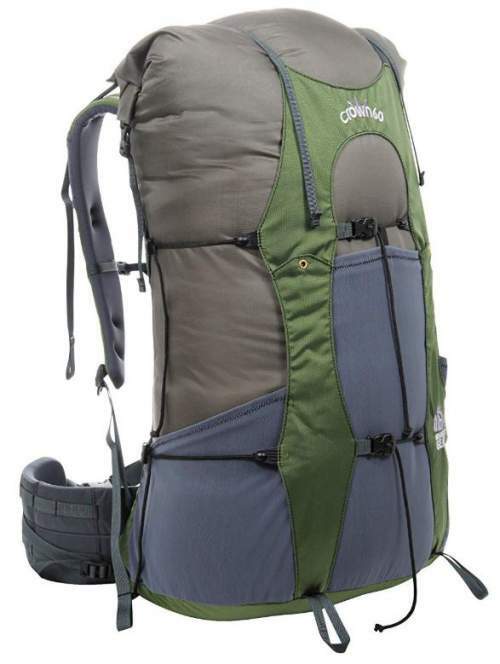 So this is a relatively lightweight pack, it weighs 1.9 kg (4 lb 3 oz), and the name suggests that you have the volume of 60 + 10 liters (3661 + 610 in³). The volume/weight ratio here is VW = 32 l/kg. This is a top loader and you also have a bottom compartment with a real zippered divider, so you can open it and use the inner space as one single unit. I guess the best part of this pack is its suspension system and its attachment elements. So the harness is fully adjustable, and it is supported by an aluminum X-frame behind the back padding. You have a generous padding on its hip belt which is with dual V-shaped straps on both sides. The mentioned attachments elements are partly visible in the picture above, so you have them many, on the top lid, on the bottom, on the front, you have poles attachment loops paired with bungee tie-offs, etc. 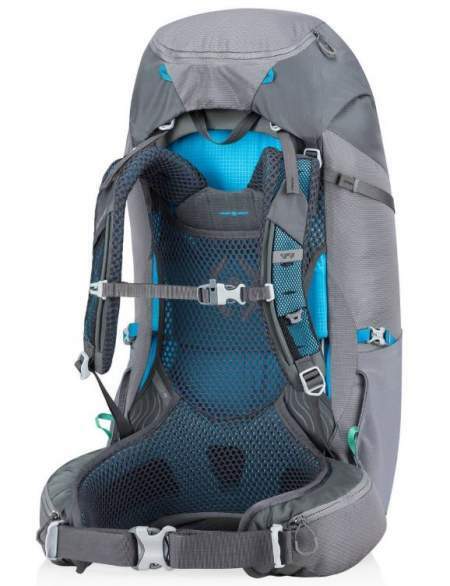 But you also have dual compression straps on the sides, plus dual straps on the bottom compartment. The pack has 7 pockets with external access. However, it is without the rain cover, bear this in mind if this is important for you. Please read more in my full review. Deuter Futura Vario 45+10 SL. The Futura Vario series has been modified in 2018 and here you have the smaller of the two packs which is a women-specific design. The pack is better than ever and if you want something with a great ventilation system, this is it. Here you have a tensioned trampoline style mesh which keeps the pack separated from your body all the time. You have 3 entry points, from the top, from the bottom, and from the front. The rain cover is also included. The volume/weight ratio here is modest VW = 27 l/kg. But when you see what this pack offers, you realize that this is justified. You have a steel frame here, and there are 9 + 1 pockets, and among them, you have 2 upper side zippered pockets. The divider between the two compartments is with zipper, so all these useful elements add weight. The number +10 in the name indicates that you have extra 10 liters of volume when you expand the collar. The lid is designed so that it can be raised up to accommodate for such an extra volume. So the true volume here is indeed 55 liters. Please follow the link for more. This is a pack which is definitely in the group of ultra-lightweight packs. It is built in two sizes, short (S) with 55 liters (3350 in³) and regular (R) with 60 liters (3661 in³), and the weight is 0.9 kg (2 lb) for S, and 0.96 kg (2 lb 2 oz ) for R size. The volume/weight ratio here is VW = 62 l/kg. As for the features, to start from the top where you have a roll-top closure instead of the classic lid. The hip belt is interchangeable so you can find the best fit for your body size. But there is no torso length adjustability so chose carefully one of the two mentioned sizes. A number of other things are missing here so this explains its weight. For example, there are no hip belt pockets, there is no internal metal frame, it is without a separate bottom compartment, and the rain cover is missing. Gregory Deva 70 Pack For Women. The Deva series by Gregory has been around for many years already. But they have modified their famous Baltoro & Deva packs and I have blogged about this in my separate text. So the model presented here is from this modified series and the changes are quite substantial, the pack looks like a completely new model. The biggest changes are in the back panel and on the front of the pack. This is a pack so rich in features that it is difficult to choose where to start. So here are a few basic facts about this great load-hauling backpack. It is built with 15 different combinations in sizes for the hip belt and harness, and the pack is in 3 sizes. The harness is not fully adjustable, but you have 2 different positions for the torso length. The rain cover is included here. The pack comes with what they call the Auto Angle Adjust (A3) hip belt and shoulder harness. You also have a QuickStow system for glasses on the shoulder harness. The mentioned back panel is now Matrix ventilated type. The backpack has 3 access points, from the top, from the bottom, and from the front. You also have crossover compression straps system, and if you love pockets, no worry, you have them 10 here. Regarding the weight, this is in the group of heavy tools, with the weight in the range 4 lb 10 oz – 4 lb 15 oz (2.1 – 2.24 kg). The volume/weight ratio here is VW = 33 l/kg. So why you should consider this pack? The answer is simple – this is a very reliable tool for heavy loads, and with plenty of storage elements for the organization. Please see more in my full review. The Jade series has been around for many years, but Gregory has launched a completely modified series in 2019 and this is the second largest pack in the Jade series. This is a lightweight pack and the volume/weight ratio here is VW = 35 l/kg. The most important change they did here is the adjustable shoulder harness which you see in the picture above. You also have a steel frame and anti-barrelling stays plus an HDPE sheet. A tensioned mesh separates the pack from your body so you have an excellent ventilation. There are 7 pockets in total, a rain cover is included, and the pack offers three access points to the main compartment. So you have a floating lid with the usual collar, a U-shaped zippered front access, and the bottom compartment with a removable zipper. Gregory Maven 65 Backpack For Women. This pack is not (yet) as famous as its cousin Deva from the same brand, but this may be only because it has been on the market only for a year or so. This series was launched in 2017, and I would put in in the category of very lightweight packs. Now, the meaning of this is the following: it is built in two sizes with the weight of 3 lb 6 oz and 3 lb 7 oz (1.53 and 1.56 kg). The volume/weight ratio here is very big VW = 42 l/kg. But this pack is full of features and nothing is really missing here. You have a fully adjustable harness and also a unique adjustable hip belt as well. The suspension is what they call Aerolon suspension. The pack can be used without its lid, and for this purpose, you can use the internal divider as a top flap. It comes with the Quick-stow feature on the shoulder strap for attaching glasses, you have removable bottom straps that can be used as a hip belt on the SideKick daypack. Now this daypack, in fact, doubles as the internal reservoir sleeve. And yes, this pack also comes with a rain cover. So you realize how complete this pack is, it comes with everything you need and still with a very good weight. Plenty of reasons to read my full review. Gregory Octal 55 Pack For Women shown with the removed lid. This Octal 55 is a part of a completely new ultra-lightweight series that Gregory launched in 2018. You might want to know that they have the corresponding series for men under the name Optic. So this is indeed an ultralight series but very few features are missing here. You have an excellent hip belt and lumbar zone padding, a moisture-wicking Aerospan suspension, and ventilated dual-density shoulder harness and hip belt. 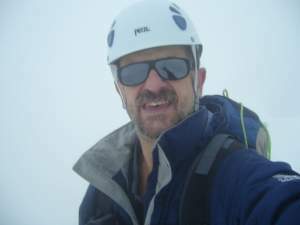 The pack is designed for a lidless use and for this you have an integrated FlapJack. You also have a QuickStow system for sunglasses, and the pack comes with a bonus rain cover. The harness is not adjustable, but the pack is built in three sizes. You have only the top access to the main compartment, there are 7 pockets in total and all attachment elements that you need. The weight is 2.4 lb (1.09 kg), can you believe this in view of all the features mentioned above? So the volume/weight ratio here is VW = 50 l/kg. They have built an excellent pack. Please read more in my full review. 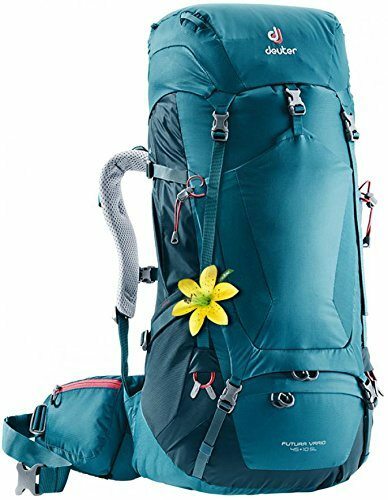 Kelty Women’s Coyote 60 Backpack. The Coyote series has also been around for a number of years already, but only in 2017, they have launched this women-specific version, the Coyote 60 pack. I am convinced this pack will become evergreen, it is so nicely built and rich in features. Regarding the weight, it is in the group of heavier tools, it weighs 4 lb 10 oz (2.1 kg). The volume/weight ratio here is VW = 29 l/kg. But wait to see all its features and you will realize this weight is justified. So let me start with its pockets – it has them 10. This is also a pack with dual access to the main compartment, you have the usual top entry point plus a large U-shaped zippered access from the front. But the pack is also with the bottom compartment and you have a removable divider here. Why to consider this pack? The suspension is probably its best part (apart from the incredible pockets organization), so you have the PerfectFit suspension, the Kelty’s unique design. This means that you can adjust the torso length with the pack on your back, no need to take it down. This is the best possible way to find your perfect fit when the pack is fully loaded and already on your body, hence the name. The padding on the harness, on the back, and on the hip belt is simply incredible. So please continue reading by following the link below. Kelty Reva 60 Backpack For Women. The design of the Reva 60 pack may look a bit simplified and minimalist, but as I see it, its best part is its suspension. Now, it is not as ventilated as in some other packs here in the list, but it looks so incredibly pleasant and comfortable. The suspension system here is something unique, they call it the Kinesis system. The meaning is that the two sides pivot individually, adjusting themselves to the body movement automatically. When one side moves down, the other moves up. The harness is adjustable and the system includes the PerfectFit design, the same what you have in their Coyote 60 pack. This is a part of a new series they launched in 2017, so you also have a pack of 45 liters, and two packs for men under the name Revol, see the 66 liters version here. This is a lightweight pack with 4 lb 1 oz (1.84 kg) only, so the volume/weight ratio is VW = 33 l/kg. The pack is a top-loader and you also have the bottom compartment, plus 7 pockets, and a separate external compartment for the water bladder. Note that there is no rain cover included here, but this pack is one of the most affordable options here. 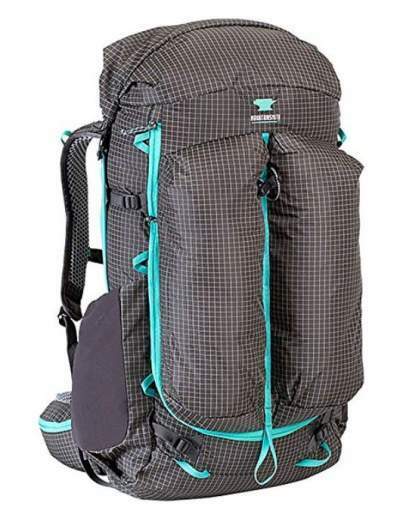 Mountainsmith Scream 50 Backpack For Women. 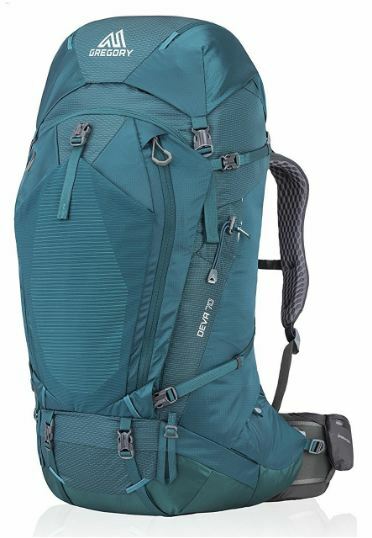 With the volume of 50 liters, this pack is probably too small for many backpackers, but I give it here because of its exceptional weight and features combination. If you are an ounce counter, you will probably go for less bulky and less heavy items in the pack, and in such a case uou might be doing good even with a pack of this size. The Scream series is not new, but in 2018 they have modified the series completely and also added this women’s specific design pack, so this is a completely new item on the market and in the series. 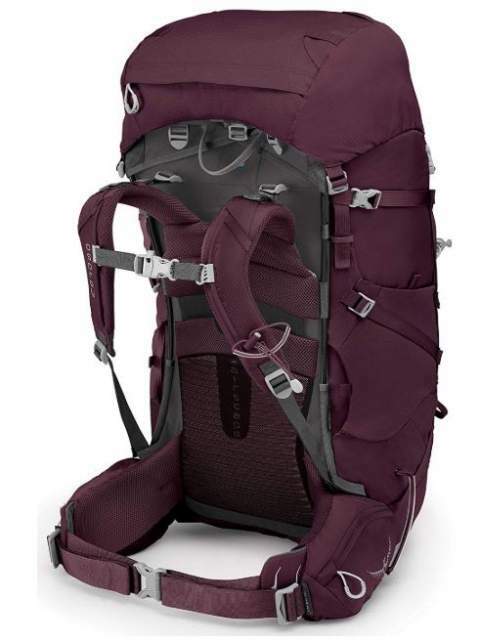 This is indeed an ultra-lightweight pack with 2 lb 10 oz (1.20 kg), and the volume/weight ratio here is VW = 42 l/kg, a rather minimalist design with a great carry capacity and a roll-top closure. The pack is with two access points, from the top where you have a roll-top system, plus the front access. Note that there is no bottom compartment and the harness length is fixed. There is no rain cover here, but you have 6 pockets, plus 9 webbing loops to attach the gear, this may compensate for its relatively low volume. Yet another reason to consider this pack is its incredible price, you will hardly find something more affordable, please see more in the link below. 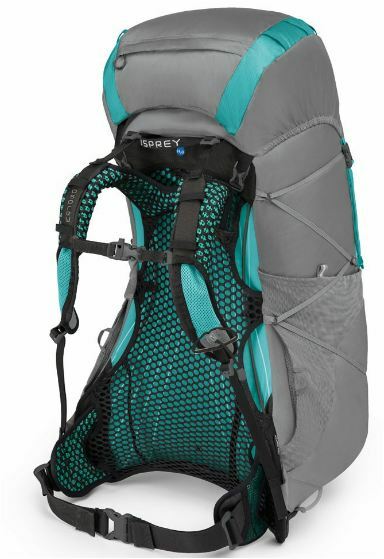 Osprey Ariel AG 65 Pack For Women. 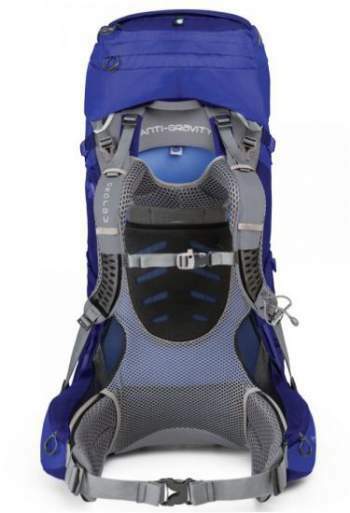 The Ariel AG 65 is a part of the famous Aether & Ariel series by Osprey. This series became AG in 2017 and I blogged about them when they appeared, see my earlier text. So the version presented here is this AG (anti-gravity) pack. This is one of the two best series (together with the Aura presented below) they have ever built. Note that you also have the 55-liter version described in detail here in the site. This is an incredible design and a pack loaded with features. One of its best features is the top lid which converts to a fully functional DayLid daypack, one of the best that you can find on the market. Yet another unique feature (which you may find in some other packs of Osprey) is its heat-moldable hip belt. So this is a special kind of foam that will adjust to your body to make a perfect fit, and this will happen by itself due to your body heat. But if you want to speed the process up, they have a special oven where you can heat the hip belt. Many well-equipped outdoor shops have it. The pack is built in 4 different sizes, and the hip belt is also in 4 sizes, so you can choose your best size. Appart from this, the harness is fully adjustable. You have 7 pockets here and numerous attachment elements, some quite unique. Note that the rain cover is available on the EU market but it is not included on the US market. This pack is rather heavy, the 65 liters version weighs 5.12 lb (2.32 kg). The volume/weight ratio here is VW = 28 l/kg. Please read more in my full review. 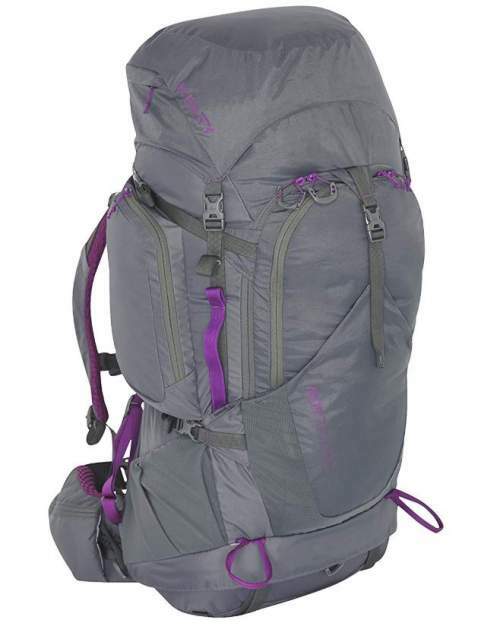 Osprey Aura AG 65 Pack For Women. If you are familiar with the Osprey’s Atmos & Aura series, then you know that it has been on the market for many years already. But a couple of years ago they have added the anti-gravity suspension to this series as well. However, they have further modified this series in 2018, and I blogged about this in my earlier text, so it is again the AG series and it is probably better than ever. 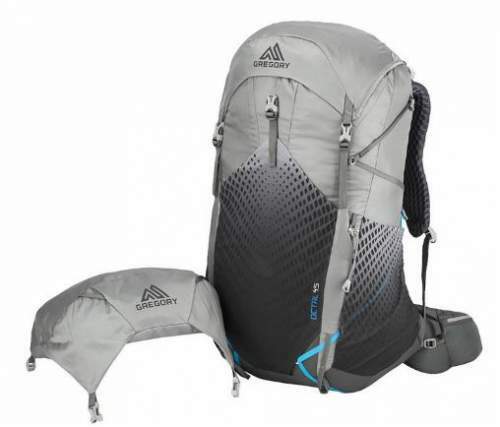 When I put this 65-liters version here in the list, bear in mind that you also have the Aura AG 50 if you need a smaller pack with the same features. 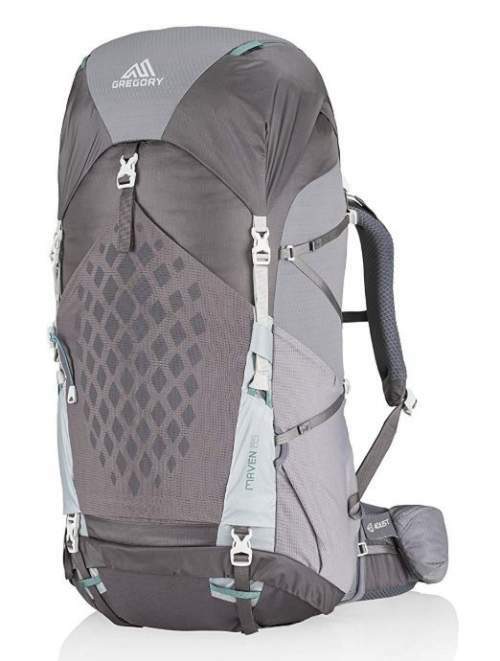 In any case, this is one of the best packs that Osprey has ever built, and it is one of the best on the market in general. The AG suspension which you have here is unique and you will not find anything similar in other brands. So, apart from the exceptional AG suspension, you also have the following features here: a Flap Jacket for a leadless use, you have 3 sizes to choose from, the pack comes with a unique adjustable Fit-on-the-Fly hip belt, the harness is fully adjustable so you will always be able to find your best fit, you also have Osprey’s unique Stow-on-the-Go poles attachment system, and the pack comes with no less than 9 pockets. 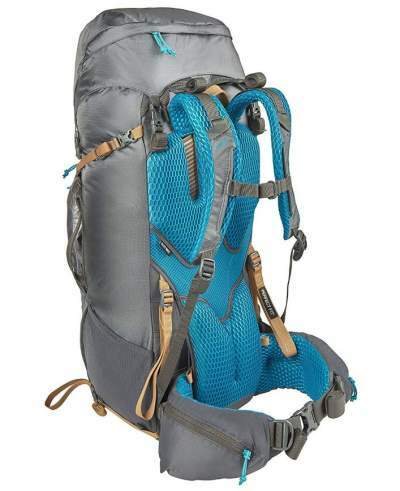 The three sizes are with the different weight, but the 65-liters version is 4.42 lb (2.01 kg), so the backpack is not lightweight but this is still very reasonable for all the features which you have here. The volume/weight ratio here is VW = 32 l/kg. Note that the rain cover is not included in the US- version, but it is included on the EU market. There is much more, so please follow the link to read my full review. Osprey Eja 58 Pack For Women. Here again, you have something exceptional for two reasons. The Eja was launched in 2018 as a completely new series corresponding to the very popular Exos series for men that has been around for many years already. So this year they have modified the Exos models (for men) as well and you have a series here which looks like a completely new series; I blogged about it in my earlier text. Note that even the Exos models for men are totally different from their previous version. Not everybody will like this new version of Exos and the new Eja series; frankly speaking, it looks to me that they have sacrificed a lot to reduce the weight, but I would not argue about this, this is the matter of taste and priorities. I tried to make a comparison between this Exos & Eja series from one side, and the Optic & Octal from Gregory, you can read more in this text. In any case, let’s see what you have here really. The first thing which you can see in the picture above is the tensioned mesh system on the back. This is one of the most breathable and the most ventilated designs you might find on the market. But note also that the hip belt padding is quite minimalistic and the fins are rather short. 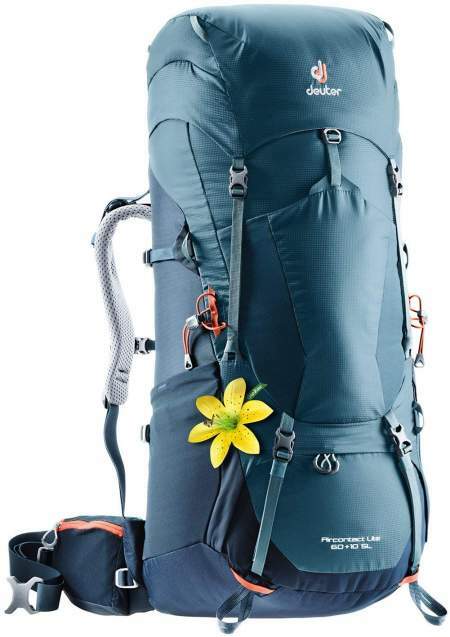 The pack is ultra-lightweight, so you have 1.17 – 1.19 kg, dependent on the size (it is built in three sizes). The volume/weight ratio here is VW = 59 l/kg. But the pack is not without features. You have a floating & removable lid and Stow-on-the-Go attachment system for poles, there are 5 pockets (no hip belt pockets, bear this in mind). The harness is not adjustable and you only have the top entrance, there is no bottom compartment here. Please read more in my review. Osprey Renn 65 Backpack For Women. This Renn 65 is from a completely new series which Osprey launched for the season 2019. 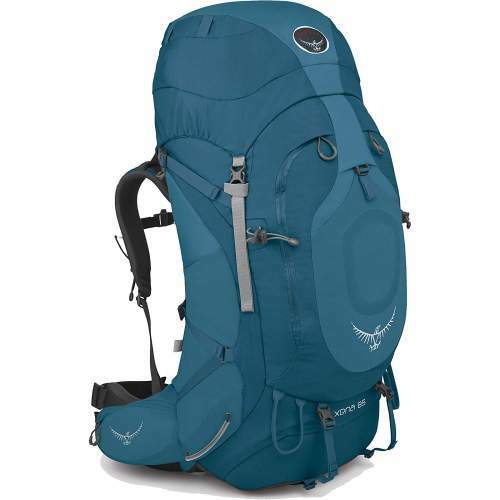 The idea behind this series is to have a pack that is affordable yet with the usual Osprey’s reliability. So they managed to build a lightweight pack that weighs only 3.44 lb (1.56 kg). The volume/weight ratio here is excellent VW = 42 l/kg. The pack comes with excellent ventilation that is based on a trampoline-style tensioned mesh back panel. So if ventilation is important for you, this is the pack to consider. It also has a fully adjustable shoulder harness and they have introduced a completely unique ladder-type system. The hip belt is fully padded and very comfortable, so the suspension is excellent here. You have the usual top access under the lid, but the pack is also with a bottom compartment and you have a removable divider inside. An additional bonus is the rain cover which comes in its own dedicated pocket on the bottom. Some features standard for Osprey packs are missing, in particular Stow-on-the-Go poles attachment system. But they wanted to make an affordable pack and they managed it. Note that they also have the corresponding packs for men in this series under the name Rook. Osprey Viva 65 with a fully adjustable harness. This Viva 65 is one of the packs that have been on the market for a number of years already, but they have improved it and launched this modified version for the 2019 season. The volume/weight ratio here is VW = 34 l/kg, so quite moderate. The pack weighs 4.21 lb (1.91 kg). So the weight is not what makes it exceptional, it is the harness. You have a fully adjustable harness, and this applies to both shoulder harness and the hip belt. The hip belt is with what they call Fit-on-the-Fly system that includes hip fins that can be moved forward and backward. The torso length is adjustable and with a Velcro tabs system. The pack comes with a rain cover included, and you also have 7 pockets plus the rain cover pocket. Full set of straps and attachment elements is there as well. Please follow the link for more. Osprey Xena 85 Backpack For Women. The Xena 85 is a part of the Xenith & Xena series from Osprey; the Xenith is as you guess the version for men. There is also Xena 70, just to know if you feel that the 85-liters version is too big. So indeed this is a big pack and I have added it here on purpose. This is for extended tours or for tours in general where you are forced to carry a lot of stuff. In view of this, everything here is in several sizes and adjustable. So the pack is in three different sizes, and the same is with its harness, and also with its hip belt. Note that you still have a full adjustability of the harness so a great fit should be guaranteed; you will need it if you carry a pack with such a load capacity. The weight of the largest of the three sub-sizes here is 2.35 kg, and and the volume/weight ratio here is VW = 36 l/kg. Here you also have the BioForm hip belt with a heat-moldable foam similar to the Ariel pack above. It will form due to your body heat and you will have a perfect fit after you carry it for some time. The belt is also split in half and you have separate front straps on the belt, so when you pull them forward, you have a perfect hugging of your hips. I do not think you can have a better system in place for such a load-hauling pack. Note that you have an external hydration sleeve here so the main compartment remains for the equipment only. The lid is removable and you can use it separately as a summit pack. The access to the main compartment is from the top, and from the two side zippers, plus through the bottom compartment where you have a removable divider. You also have 9 pockets and all possible tool loops to attach your stuff. What is best for me is not necessarily best for you. There are again at least two reasons for this: i) If you like the pack and think it is best, no argument will prove you the opposite. ii) We all are built differently. A different body shape may need a different design. What is an optimal pack for one environment/climate, is not necessarily the best option for some other, even if the pack is for the same person. For example, if you sweat a lot or plan to hike in a dry and warm area, you will want some of those with a ventilated back design. But if you are on a tour in a cold environment and need lots of stuff, you will prefer some of those with a strong and well-padded hip belt. If this is about ounce-counting, just see the list above. Choose the appropriate weight in the absolute sense and also keeping an eye on the volume-to-weight ratio. In this case, the options are clear: the Granite Gear Crown VC 60, Osprey Eja 58, Gregory Octal 55, Mountainsmith Scream 50, and Gregory Maven 65. But note that Osprey Renn 65 is there as well. Need something with best possible ventilation? No doubt you should go for Osprey Eja 58 or Osprey Renn 65, Deuter Futura Vario, Osprey Aura 65, and Osprey Ariel 65. If you need a tool for heavy loads, then my recommendation would be the following: Gregory Deva 70, Osprey Xena, Kelty Coyote 60, Deuter Aircontact Lite 60 + 10, and Kelty Reva 60. So this was my list of the best women’s backpacking packs that are currently on the market. All the models presented here are hand-picked and also described in detail in my separate reviews. The list will be updated regularly as the new models appear on the market, so bookmark this page and check from time to time. Note that there are many other packs that are not included here, so you can see them in my page with packs above 56 liters, and also in the page with packs of 35 – 55 liters. Please check also my list with best Gregory’s packs for women. If you want to see something for men, check my list with the best backpacking packs for men. Did I miss your favorite backpack? Do you have experience with any of these packs? If so let us know, please share here, there is a comment box below. Thank you for reading and have a nice day.